Threaded rod is a shaft of composed of steel, stainless steel, brass, bronze, silicon bronze, copper or other alloy which is threaded along its length. The rod can be threaded in three directions, including right hand, left hand, or both right hand and left hand. Right hand threaded rods are the most common and configured so that clockwise rotation tightens the threaded rod to a fastener. Left hand threads are less common, but well-suited for applications in which motor vibration would cause right handed threads to loosen. When a thread direction is not specified, the default direction of the threaded rod is to the right. If a left hand threaded rod is needed it should be specifically called out. Threaded rods with both right and left hand threads have right threads at one end of the rod, and left threads at the opposite end. 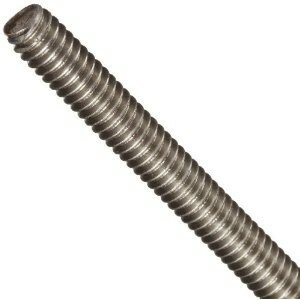 This dual thread style is used for specialty assemblies. Bearing Service stocks several sized diameters of threaded rod at our branch locations. Please contact a Bearing Service representative for more information.